RIYADH, Saudi Arabia -- Saudi Arabia's King Abdullah, the powerful U.S. ally who joined Washington's fight against al-Qaida and sought to modernize the ultraconservative Muslim kingdom with incremental but significant reforms, including nudging open greater opportunities for women, has died, according to Saudi state TV. He was 90. More than his guarded and hidebound predecessors, Abdullah assertively threw his oil-rich nation's weight behind trying to shape the Middle East. His priority was to counter the influence of rival, mainly Shiite Iran wherever it tried to make advances. He and fellow Sunni Arab monarchs also staunchly opposed the Middle East's wave of pro-democracy uprisings, seeing them as a threat to stability and their own rule. He backed Sunni Muslim factions against Tehran's allies in several countries, but in Lebanon for example, the policy failed to stop Iranian-backed Hezbollah from gaining the upper hand. And Tehran and Riyadh's colliding ambitions stoked proxy conflicts around the region that enflamed Sunni-Shiite hatreds - most horrifically in Syria's civil war, where the two countries backed opposing sides. 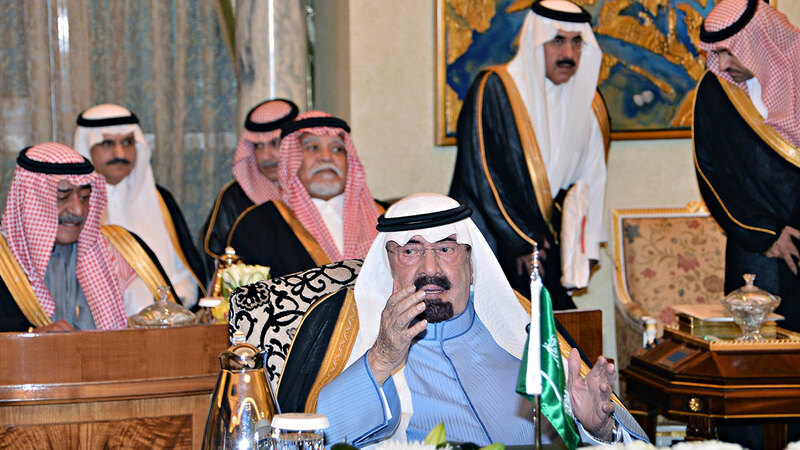 Those conflicts in turn hiked Sunni militancy that returned to threaten Saudi Arabia. And while the king maintained the historically close alliance with Washington, there were frictions as he sought to put those relations on Saudi Arabia's terms. He was constantly frustrated by Washington's failure to broker a settlement to the Israel-Palestinian conflict. He also pushed the Obama administration to take a tougher stand against Iran and to more strongly back the mainly Sunni rebels fighting to overthrow Syrian President Bashar Assad. Abdullah's death was announced on Saudi state TV saying the king died after midnight on Friday. His successor is his 79-year-old half-brother, Prince Salman, who has recently taken on the ailing Abdullah's responsibilities, according to the official Saudi Press Agency. Abdullah was born in Riyadh in 1924, one of the dozens of sons of Saudi Arabia's founder, King Abdul-Aziz Al Saud. Like all Abdul-Aziz's sons, Abdullah had only rudimentary education. Tall and heavyset, he felt more at home in the Nejd, the kingdom's desert heartland, riding stallions and hunting with falcons. His strict upbringing was exemplified by three days he spent in prison as a young man as punishment by his father for failing to give his seat to a visitor, a violation of Bedouin hospitality. In 2000, Abdullah convinced the Arab League to approve an unprecedented offer that all Arab states would agree to peace with Israel if it withdrew from lands it captured in 1967. The next year, he sent his ambassador in Washington to tell the Bush administration that it was too unquestioningly biased in favor of Israel and that the kingdom would from now on pursue its own interests apart from Washington's. Alarmed by the prospect of a rift, Bush soon after advocated for the first time the creation of a Palestinian state alongside Israel. The next month, the Sept. 11, 2001 terror attacks took place in the United States, and Abdullah had to steer the alliance through the resulting criticism. The kingdom was home to 15 of the 19 hijackers, and many pointed out that the baseline ideology for al-Qaida and other groups stemmed from Saudi Arabia's Wahhabi interpretation of Islam. The tougher line helped affirm Abdullah's commitment to fighting al-Qaida. He paid two visits to Bush - in 2002 and 2005 - at his ranch in Crawford, Texas. His aim at home was to modernize the kingdom to face the future. One of the world's largest oil exporters, Saudi Arabia is fabulously wealthy, but there are deep disparities in wealth and a burgeoning youth population in need of jobs, housing and education. More than half the current population of 20 million is under the age of 25. For Abdullah, that meant building a more skilled workforce and opening up greater room for women to participate. He was a strong supporter of education, building universities at home and increasing scholarships abroad for Saudi students. The changes seemed small from the outside but had a powerful resonance. Small splashes of variety opened in the kingdom - color and flash crept into the all-black abayas women must wear in public; state-run TV started playing music, forbidden for decades; book fairs opened their doors to women writers and some banned books. But he treaded carefully in the face of the ultraconservative Wahhabi clerics who hold near total sway over society and, in return, give the Al Saud family's rule religious legitimacy. Senior cleric Sheik Saleh al-Lihedan warned against changes that could snap the "thread between a leader and his people." In some cases, Abdullah pushed back: He fired one prominent government cleric who criticized the mixed-gender university. But the king balked at going too far too fast. For example, beyond allowing debate in newspapers, Abdullah did nothing to respond to demands to allow women to drive. "He has presided over a country that has inched forward, either on its own or with his leadership," said Karen Elliot House, author of "On Saudi Arabia: Its People, Past, Religion, Fault Lines." "I don't think he's had as much impact as one would hope on trying to create a more moderate version of Islam," she said. "To me, it has not taken inside the country as much as one would hope." And any change was strictly on the royal family's terms. After the 2011 Arab Spring uprisings in particular, Saudi Arabia clamped down on any dissent. Riot police crushed street demonstrations by Saudi Arabia's Shiite minority. Dozens of activists were detained, many of them tried under a sweeping counterterrorism law by an anti-terrorism court Abdullah created. Authorities more closely monitored social media, where anger over corruption and unemployment - and jokes about the aging monarchy - are rife. Regionally, perhaps Abdullah's biggest priority was to confront Iran, the Shiite powerhouse across the Gulf. Worried about Tehran's nuclear program, Abdullah told the United States in 2008 to consider military action to "cut off the head of the snake" and prevent Iran from producing a nuclear weapon, according to a leaked U.S. diplomatic memo. In Lebanon, Abdullah backed Sunni allies against the Iranian-backed Shiite guerrilla group Hezbollah in a proxy conflict that flared repeatedly into potentially destabilizing violence. Saudi Arabia was also deeply opposed to longtime Iraqi Prime Minister Nouri al-Maliki, whom it considered a tool of Iran oppressing Iraq's Sunni Muslim minority. In Syria, Abdullah stepped indirectly indirectly into the civil war that emerged after 2011. He supported and armed rebels battling to overthrow President Bashar Assad, Iran's top Arab ally, and pressed the Obama administration to do the same. Iran's allies Hezbollah and Iraqi Shiite militias rushed to back Assad, and the resulting conflict has left hundreds of thousands dead and driven millions of Syrians from their homes. From the multiple conflicts, Sunni-Shiite hatreds around the region took on a life of their own, fueling Sunni militancy. Syria's war helped give birth to the Islamic State group, which burst out to take over large parts of Syria and Iraq. Fears of the growing militancy prompted Abdullah to commit Saudi airpower to a U.S.-led coalition fighting the extremists. Toby Matthiesen, author of "Sectarian Gulf: Bahrain, Saudi Arabia, and the Arab Spring That Wasn't," said Abdullah was not "particularly sectarian in a way that he hated Shiites for religious reasons. ... There are other senior members of the ruling family much more sectarian." But, he said, "Saudi Arabia plays a huge role in fueling sectarian conflict."